Three out of four accidents result from improper human performance. [Figure 2-1] The human element is the most flexible, adaptable, and valuable part of the aviation system, but it is also the most vulnerable to influences that can adversely affect its performance. Figure 2-1. Three out of four accidents result from human error. The study of human behavior is an attempt to explain how and why humans function the way they do. A complex topic, human behavior is a product both of innate human nature and of individual experience and environment. Definitions of human behavior abound, depending on the field of study. In the scientific world, human behavior is seen as the product of factors that cause people to act in predictable ways. The Federal Aviation Administration (FAA) utilizes studies of human behavior in an attempt to reduce human error in aviation. Historically, the term “pilot error” has been used to describe an accident in which an action or decision made by the pilot was the cause or a contributing factor that led to the accident. This definition also includes the pilot’s failure to make a correct decision or take proper action. From a broader perspective, the phrase “human factors related” more aptly describes these accidents. A single decision or event does not lead to an accident, but a series of events; the resultant decisions together form a chain of events leading to an outcome. Many of these events involve the interaction of flight crews. In fact, airlines have long adopted programs for crew resource management (CRM) and line oriented flight training (LOFT) which has had a positive impact upon both safety and profit. These same processes can be applied (to an extent) to general aviation. Human error may indicate where in the system a breakdown occurs, but it provides no guidance as to why it occurs. The effort of uncovering why pilots make mistakes is multidisciplinary in nature. In aviation—and with pilots in particular—some of the human factors to consider when examining the human role are decision-making, design of displays and controls, flight deck layout, communications, software, maps and charts, operating manuals, checklists and system procedures. Any one of the above could be or become a stressor that triggers a breakdown in the human performance that results in a critical human error. Since poor decision-making by pilots (human error) has been identified as a major factor in many aviation accidents, human behavior research tries to determine an individual’s predisposition to taking risks and the level of an individual’s involvement in accidents. Drawing upon decades of research, countless scientists have tried to figure out how to improve pilot performance. Is there an accident-prone pilot? A study in 1951 published by Elizabeth Mechem Fuller and Helen B. Baune of the University of Minnesota determined there were injury-prone children. The study was comprised of two separate groups of second grade students. Fifty-five students were considered accident repeaters and 48 students had no accidents. Both groups were from the same school of 600 and their family demographics were similar. The accident-free group showed a superior knowledge of safety and were considered industrious and cooperative with others but were not considered physically inclined. The accident-repeater group had better gymnastic skills, were considered aggressive and impulsive, demonstrated rebellious behavior when under stress, were poor losers, and liked to be the center of attention. [Figure 2-2] One interpretation of this data—an adult predisposition to injury stems from childhood behavior and environment—leads to the conclusion that any pilot group should be comprised only of pilots who are safety conscious, industrious, and cooperative. Clearly, this is not only an inaccurate inference, but is impossible to achieve since pilots are drawn from the general population and exhibit all types of personality traits. Figure 2-2. According to human behavior studies, there is a direct correlation between disdain for rules and aircraft accidents. Figure 2-3. The pilot inadvertently fed both engines from the left fuel tank and failed to determine the problem for the right wing low. His lack of discipline resulted in an accident. After two hours of flight, the right engine quit when Everyman was flying along a deep canyon gorge. While he was trying to troubleshoot the cause of the right engine’s failure, the left engine quit. Everyman landed the aircraft on a river sand bar, but it sank into ten feet of water. Several years later, Everyman was landing a de Havilland Twin Otter when the aircraft veered sharply to the left, departed the runway, and ran into a marsh 375 feet from the runway. The airframe and engines sustained considerable damage. Upon inspecting the wreck, accident investigators found the nosewheel steering tiller in the fully deflected position. Both the after-takeoff and before-landing checklists required the tiller to be placed in the neutral position. Everyman had overlooked this item. Now, is Everyman accident prone or just unlucky? 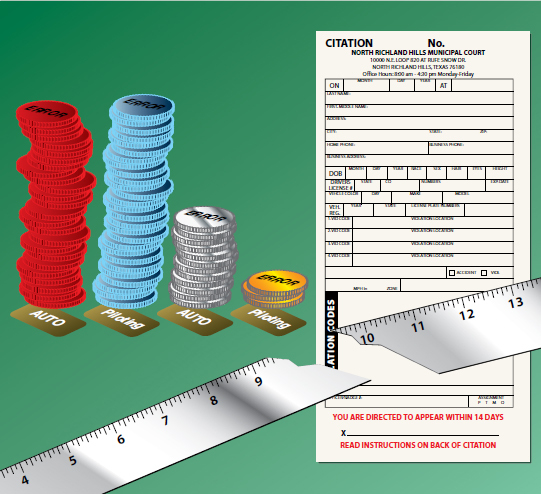 Skipping details on a checklist appears to be a common theme in the preceding accidents. While most pilots have made similar mistakes, these errors were probably caught prior to a mishap due to extra margin, good warning systems, a sharp copilot, or just good luck. In an attempt to discover what makes a pilot accident prone, the Federal Aviation Administration (FAA) oversaw an extensive research study on the similarities and dissimilarities of pilots who were accident free and those who were not. The project surveyed over 4,000 pilots, half of whom had “clean” records while the other half had been involved in an accident. Figure 2-4. Pilots with hazardous attitudes have a high incident rate of accidents. In contrast, the successful pilot possesses the ability to concentrate, manage workloads, monitor, and perform several simultaneous tasks. Some of the latest psychological screenings used in aviation test applicants for their ability to multitask, measuring both accuracy and the individual’s ability to focus attention on several subjects simultaneously. Research has also demonstrated significant links between pilot personality and performance, particularly in the area of crew coordination and resource management. Three distinct subgroups of flight crew member personalities have been isolated: right stuff, wrong stuff, and no stuff. As the names imply, the right stuff group has the right stuff. This group demonstrates positive levels of achievement motivation and interpersonal behavior. The wrong stuff group has high levels of negative traits, such as being autocratic or dictatorial. The no stuff group scored low on goal seeking and interpersonal behaviors. These groups became evident in a 1991 study, “Outcomes of Crew Resource Management Training” by Robert L. Helmreich and John A. Wilhelm. During this study a subset of participants reacted negatively to the training–the individuals who seemed to need the training the most were the least receptive. The authors felt that personality factors played a role in this reaction because the ones who reacted negatively were individuals who lacked interpersonal skills and had not been identified as members of the “right stuff” subset. It was surmised that they felt threatened by the emphasis on the importance of communications and human relations skills. 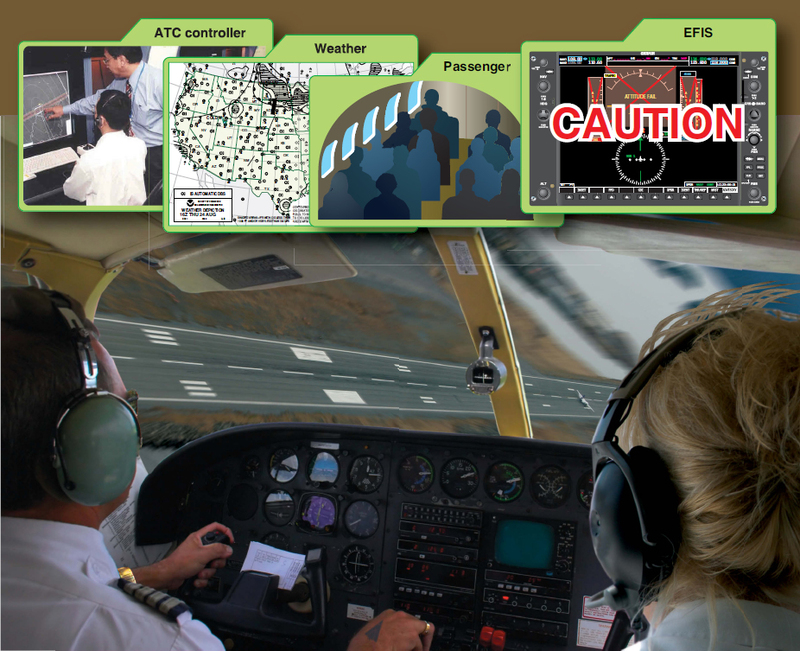 The influence of personality traits can be seen in the way a pilot handles a flight. For example, one pilot may be uncomfortable with approximations and “guesstimates,” preferring to use his or her logical, problem-solving skills to maintain control over instrument flight operations. Another pilot, who has strong visual-spatial skills and prefers to scan, may apply various “rules of thumb” during a instrument flight period. The first pilot’s personality is reflected in his or her need to be planned and structured. The second type of pilot is more fluid and spontaneous and regards mental calculations as bothersome. No one ever intends to have an accident and many accidents result from poor judgment. For example, a pilot flying several trips throughout the day grows steadily behind schedule due to late arriving passengers or other delays. Before the last flight of the day, the weather starts to deteriorate, but the pilot thinks one more short flight can be squeezed in. It is only 10 minutes to the next stop. But by the time the cargo is loaded and the flight begun, the pilot cannot see the horizon while flying out over the tundra. The pilot decides to forge on since he told the village agent he was coming and flies into poor visibility. The pilot never reaches the destination and searchers find the aircraft crashed on the tundra. In this scenario, a chain of events results in the pilot making a poor decision. First, the pilot exerts pressure on himself to complete the flight, and then proceeds into weather conditions that do not allow a change in course. In many such cases, the flight ends in controlled flight into terrain (CFIT). In a 2005 FAA study, it became apparent that human error associated with GA accidents is multifaceted. 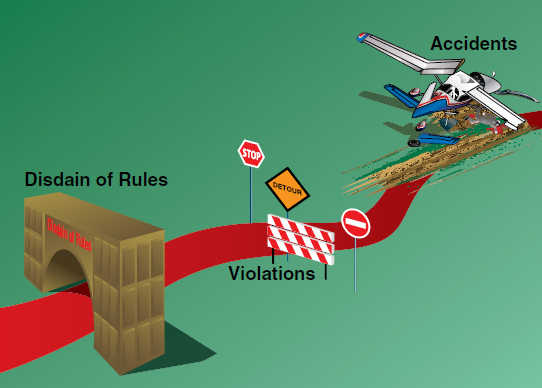 Specifically, the analyses revealed that the largest percentage of accidents is associated with skill-based errors, followed by decision errors, violations of the rules and regulations, and perceptual errors. [Figure 2-5] The next step will be identifying a variety of interventions targeted at all four error groups. Eliminating human errors is an unrealistic goal since errors are a normal part of human behavior. On the other hand, realizing that many aviation accidents are preventable means designing ways to reduce the consequences of human error. The study of human behavior coupled with pilot training that offsets predictable human error helps achieve that goal. Figure 2-5. 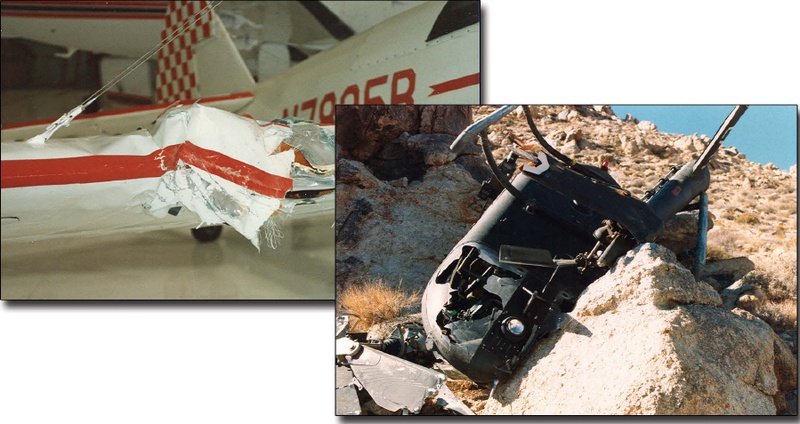 Accident-prone pilots fail to use readily available resources, or they simply do not listen.